HOW TO RECOGNIZE THE HAND IN DOWN SYNDROME? – 27 Characteristics! How to recognize the hand in Down syndrome? Lionel Sharples Penrose introduced in 1963 in the magazine Nature the first ‘phantom picture’ for the hand in Down syndrome. The picture described some of the typical characteristics of the hand in Down syndrome – including the ‘simian crease’. Later more detailed ‘phantom pictures’ were presented by Schaumann & Alter (1976), and Rodewald (1981). In januari 2010 a more detailed version became available – describing 27 characteristics of the hand in Down’s syndrome! What are the most typical hand characteristics in Down’s syndrome? A common characteristic is the presence of the famous ‘simian line‘; an alternative is the presence of another unusual hand line: the Sydney line. 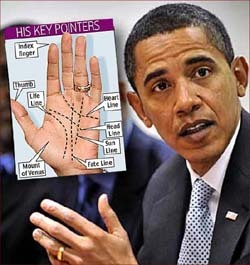 Here one should especially notice the hypothenar zone of the hand (in palmistry a.k.a. ‘mount of moon’); usually this zone a large ‘ulnar loop’ pattern combined with a high positioned palmar axial triradius. 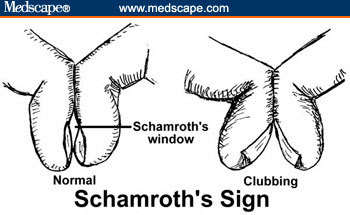 Short fingers (thumb and pinky finger are often abnormally short) + a square shaped palm. NOTICE: The author of the new ‘phantom picture’ for Down syndrome described a specific guideline which states that in all cases of Down syndrome certain combinations of the 27 characteristics are found in both the fingers AND the palm of the hand! How to use the simian line + 26 other characteristics as a hand marker in Down’s syndrome! HANDS & CANCER – Part 1: Nail clubbing, a famous indicator for various types of cancer! 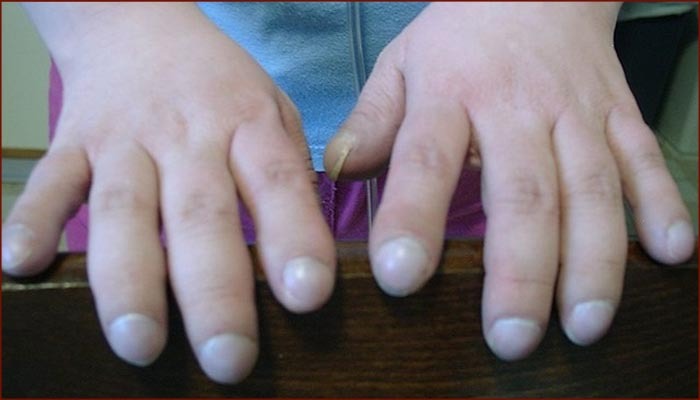 Clubbing in the fingers of a 33-year old female with pulmonary hypertension. Nail clubbing is found in 29% of lung cancer patients! ‘Fingernail clubbing’ is one of most well-know indicators for recognizing cancer in the hand. A.k.a. ‘Hippocratic nail’ this nail characteristic been known since the early days of the Greek philosopher Hippocrates, who recognized nail clubbing as a classic sign of disease. Today ‘nail clubbing’ is associated various lung diseases, especially lung cancer with non–small cell lung carcinoma. Nail clubbing is also linked with heart problems and gastrointestinal problems – but these are less common than lung problems. How to recognize ‘clubbing fingernails’? Clubbing is usually a painless but complex fingernail disorder which often goes unnoticed of it’s presence in the hands of patients! In individuals without clubbing, if two opposing fingers are placed together, a diamond-shaped window will appear. In clubbing, this window is obliterated and the distal angle formed by the two nails becomes wider. This is known as Schamroth sign window test. Actress Megan Fox has a ‘clubbed thumb’ – which should not be confused with ‘nail clubbing’. • Nail clubbing: developments, treatment & prevention! • Hands on lung cancer: the clubbing fingernail! • Overview of more common nail disorders! • Megan Fox has a ‘clubbed thumb’ – not to be confused with ‘fingernail clubbing’!! THE ‘MOON WHORL’ – A common characteristic in schizophrenia, Down’s syndrome… and autism? The ‘whorl on the mount of Moon’ (a.k.a. the ‘hypothenar whorl’) is known as one of the mysterious characteristics that can only sometimes be found in the human hand. In 1943 Cummins & Midlo reported in their famous ‘Finger Prints, Palms & Soles’ statistics for a sample of 1281 German males. They found the ‘true whorl’ on the hypothenar in only 0.7% of right hands and 0.5% of left hands! What do we know about the ‘Moon whorl’? NEW RESEARCH FINDING ON AUTISM! Some examples of the ‘hypothenar composite whorl’ are presented below. In the perspective of the fact that in the science of fingerprints the ‘composite whorl’ is related to the ‘double loop’, it is interesting to notice here that the new finding appears to confirm an earlier reported finding which pointed out that the hands of people with autism are often featured with a ‘double loop’ in the fingerprint of the pinky finger and the presence of 2 palmar loops below that 5th finger. 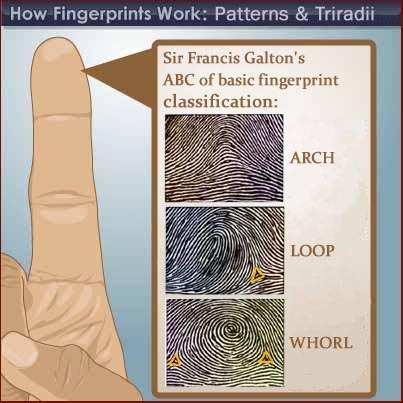 In cases you’re interested to learn more about the basics of fingerprint classification – the illustration below describes the 8 most common types of fingerprints (including: 2 ‘arch’ variants, 2 ‘loop’ variants, and 4 ‘whorl’ variants). • Forensic experts say: ‘fingerprints reveal more’! • A historical review of research on dermatoglyphics! 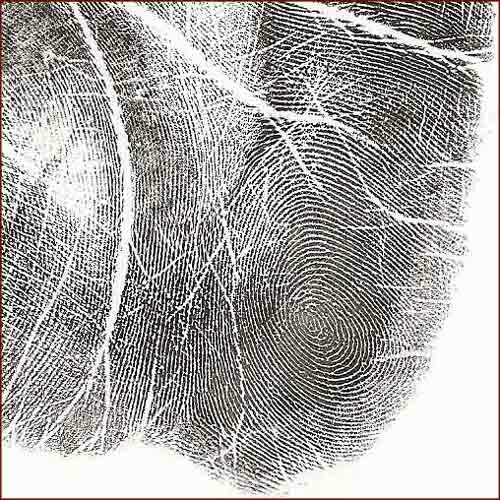 PICTURE: In the science of fingerprints ‘whorls’ is known a one of the 3 basic patterns (next to ‘loops’ and ‘arches’) – about 75% of people have at least 1 fingerprint whorl! PALM READING – The Palmistry books TOP 100! 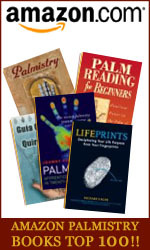 What are the best Palmistry books today? The Amazon Palmistry books TOP 100! How is ‘Palmistry books TOP 100’ compiled? The rankings in this unique TOP 100 are based on the ‘Amazon sales rank‘ – a significant indicator which provides reliable info about how books are selling (online) around the world today. 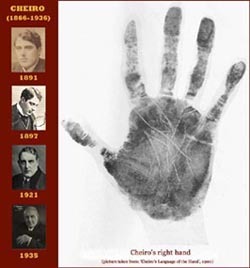 The “Amazon Palmistry TOP 100” presents a mix of old & new books about classic palmistry (including famous authors e.g. : William G. Benham & Cheiro) & modern palm reading (including respected authors e.g. : Richard Unger & Nathaniel Altman). Interestingly, palmistry & hand analysis experts from the ‘Global Palm Reader Network’ are provided the opportunity to send their ‘votes’ (positive AND negative! 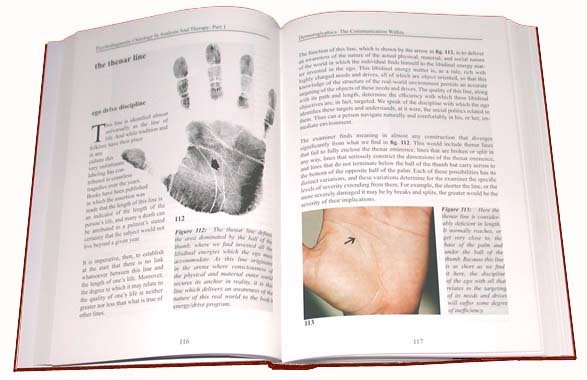 ), in order to establish an additional RANKING for those palm reading & hand analysis books which present the highest ‘quality’ – as defined by the individual experts in this field! What is your favourite palmistry- or hand reading book? Please, feel free to name the title(s) if your favourite book(s) is not listed!! NOTICE: The ‘voting system’ has only been introduced in the first week of november 2009 – so the true impact of these votes should likely become visible early in 2010! • The Amazon Palmistry BOOKS TOP 100! • The Palmistry WEBSITES TOP 100! • HAND FACTS – News & Reports! Palmisty TOP 100 – the most popular websites in the fields of palm reading & hand analysis! What are today the world’s most popular websites presented by (professional) palm readers? The NEW Palmistry TOP 100!! In september 2009 a new (improved) palmistry ‘ranking’ formula (based on internet statistics) was presented – and you can now take a look at the result! 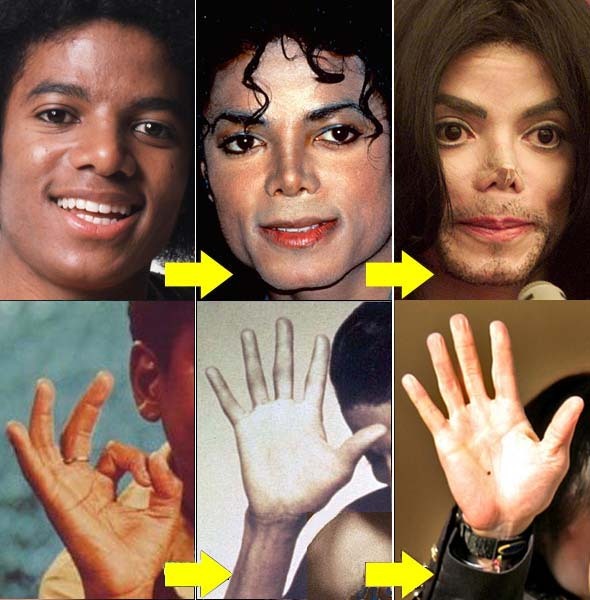 The hands of Michael Jackson – hand cast + a few palm readings! 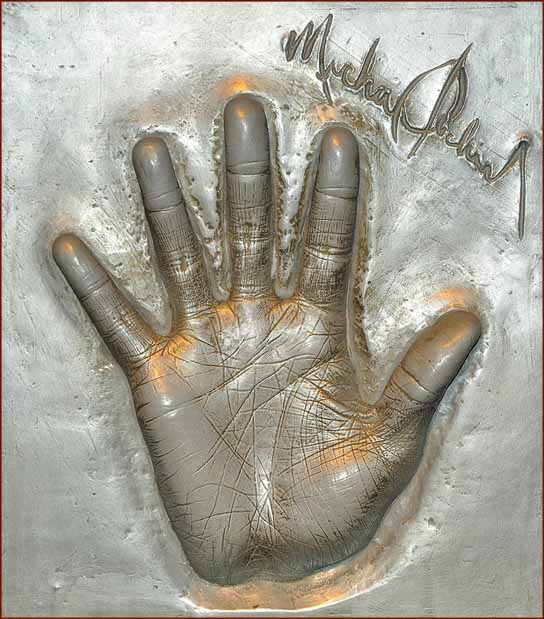 Michael Jackson’s hand cast at Madame Tussauds in Berlin – ‘click’ for the full covered story! The hands of Michael Jackson – the FULL PALM READING STORY!! • Peter John (Canada) – Michael Jackson youtube palm reading’. In february 2009 various media published ‘shocking’ photos reports about the state of Michael Jackson’s hands. Only 4 months later – june 25, 2009 – Michael Jackson suffered a cardiac arrest and suddenly died. The first part of this article is a tribute to the hands of the ‘King of Pop’ & his famous hand glove icon! Additional research indicates that the ‘health’ of Michael’s hands deteriorated rapidly during the last year of his life. Could one have foreseen his death by the state of his hands? This question will be answered in the final part of this article. • More hand facts about Michael Jackson! • Famous hands: the hands of celebrities! Indian Palmist P.M.S. Sethi reads hands in Chittorgarh, India! Hand analysis and astrological consultancy; palmistry author. • 24% Of Indians consult a palmist! • Palm reading: how long is your life line? Hands on hand hygiene: what a palm reader should know about the swine flu! Swine flu prevention means: proper hand hygiene! A new survey in the US has indicates that many people haven’t changed their hand washing habits – despite the swine flu outbreak. The survey revealed that 54 percent of the respondents said they “wash their hands no more or less frequently” in public restrooms as a result of the virus. A major concern in the perspective of the swine flu pandemic – especially since governments has stated worldwide that hand hygiene is one of the few effective tools to prevent infection with the H1N1 influenza A virus! While the Medline hand hygiene compliance program was initially developed as a combat against healthcare acquired conditions, now it the program can serve as an additional tool for to stop the swine flu pandemic (a.k.a. the Mexican flu). While the annual deaths associated with seasonal flu in the United States is only 30,000-40,000 mainly among people over 65! THINK ABOUT YOUR HAND HYGIENE!!! • Hands on ‘hand hygiene’! • Swine flu prevention is a matter of ‘hand hygiene’! • Hand Hygiene: warm air dryers increase bacteria on hands! • Obama’s council of advisors about the swine flu! • Survey: Swine flu doesn’t change washing habits! Usain Bolt – fastest man on earth – sprint talent is in his fingers! Usain Bolt has the marker for sprint talent: a long ring finger! The 2008 olympics in Beijing pointed out that Jamaican sprinter Usain Bolt is the fastest man on sprint ever! And last sunday he set another new world record at the Athletics World Championships 2009 Berlin. How come that Jamaican sprinters run so fast? Earlier this year British researchers studied the hands of 241 boys aged 10 to 17 who took part in a sports talent-spotting competition in Qatar. And the results pointer out that a low 2D:4D finger ratio is linked with a fast sprint! Previous studies have confirmed the link between finger length and sprint talent: long-distance runners have the same hand characteristics – a ‘low 2D:4D finger ratio. But to understand the implications in this perspective one should be aware that the long ring fingers has also been linked with other ‘testosterone’ related matters such as: a lower risk of heart disease and good results in exam success in mathematics, to male aggression and higher earnings at the London Stock Exchange. So the predictive value of a long ring finger is actually pretty, and certainly not reliable in individual subjects. Nevertheless, John T. Manning has described in his first book – ‘Digit Ratio’ – that the hands of Jamaicans are usually featured with a relatively long ring finger – which is confirmed by various hand photos of the most successful sprinters from Jamaica (see the photo below). • The hands Usain Bolt – olympic world record holder sprint! • Finger length explains the success of Jamaican sprinters! • Why Jamaican sprinters run so fast! A hand germ palm reading – don’t forget your swine flu prevention! THE 10 COMMANDMENTS FOR ‘HAND HYGIENE’! • A kiss is healthier than a handshake! • Your health is in your hands! • More swine flu prevention: the 10 commandments for hand hygiene! • warning: why hand sanitizers may increase risk of swine flu exposure! • How to stop the swine flu? No handshaking, try Barack Obama’s fist bump!